LPI has concluded that physicians specializing in the practice of age management medicine are unfairly paying above market rates for their medical malpractice insurance coverage as commercial insurers have not adjusted their rating structure for this line of medical practice. We believe that selective underwriting, close oversight of claims, and risk management coupled with physician education and certification are the keys to controlling costs. While some traditional medical malpractice insurance companies do some of these, none understands the practice of age management medicine. Most malpractice insurance companies are giving age management medicine physicians family practice, internal medicine, or general practice market rates when quoting and writing their premiums. When, in fact, age management medicine malpractice claims are far lower than these traditional practices. Formed by age management medicine physicians the Longevity Physicians Insurance Company (LPI) is an association captive medical malpractice insurance company focused on age management medicine. Our primary goal is to offer affordable medical malpractice insurance with long-term stable coverage availability on favorable terms to age management physicians belonging to the Age Management Medicine Group (AMMG). LPI was formed to capture the disparity in premium pricing and pass the savings along to you! We believe that seeing fewer patients per day and focusing on prevention rather than reactive medicine results in fewer claims…and our underwriters have agreed with us. Further, when you become a Longevity Physicians Insurance policyholder, you also become an owner! "The Genesis of Longevity Physicians Insurance Company" by John Rush, M.D. 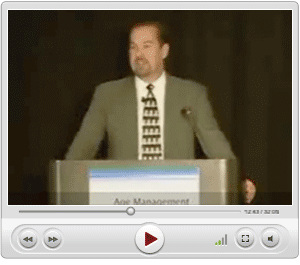 A video of Dr. Rush’s presentation at the Nov. 2010 Age Management Medicine conference. Watch Now!